Credo quia absurdum. "I believe because it is absurd." Yet again, a plainly desperate government in Jerusalem is preparing to sacrifice Israel's self-respect and its security in a single grotesque "gesture." Although the prime minister's "Open Letter" of explanation seeks to justify the impending terrorist release as a sorely lamentable but still necessary condition for future "peace talks" with the Palestinians, it is perfectly obvious that no such talks could produce meaningful results. What, exactly, is Benjamin Netanyahu thinking? On the Palestinian Authority's maps, all of Israel is already included within "Palestine." 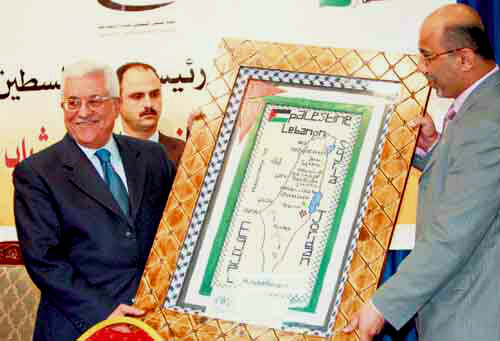 Abbas, the faux-leader of a non-people, holds the map of a projected "Palestine", which just happens to encompass all of Israel. Hillary Clinton, John Kerry.....it makes not a bit of difference. In this self-evident matter, the sitting American Secretary of State is beside the point. Yet again, however unwittingly, Washington's "good offices" will represent little more than an officially opened American back door for the next massacre of Israeli women and children by terrorist murderers. Significantly, this flawed plan is not only indecent; it is also unlawful. All countries coexist under the indisputable authority of a planet-wide law of nations. A core element of this longstanding international law is the rule of Nullum crimen sine poena, or "No crime without a punishment." This principle was reaffirmed at the post-War Nuremberg Trials (1945-46). It remains a fully conspicuous part of all national legal systems. President Barack Obama's evident concurrence in the impending Israeli terrorist release represents an incontestable act of U.S. complicity with major international crimes. Here, the U.S. will be in violation not only of international law, but also the law of the United States. This is because international law is already part of US law (the "supreme law of the land") by virtue of Article 6 of the U.S. Constitution, and also by virtue of a number of landmark Supreme Court decisions. Back in June 2003, the Shurat HaDin, Israel Law Center, in an astute anticipation of then-planned terrorist releases, had properly condemned Israel's intended freeing of 100 Palestinian prisoners. Later, almost five times that number were actually set loose by Prime Minister Ariel Sharon. Then, in her letter to the Prime Minister, and to members of his Cabinet, Shurat HaDin Director Nitsana Darshan-Leitner had written that releasing terrorists as a "goodwill gesture" would only reignite Arab terrorism against defenseless Jewish men, women, and especially children. Of course, Director Darshan-Leitner was correct. Soon thereafter, at least two newly-released Fatah-linked terrorists went on to launch suicide bomb attacks in Israel. In one of these attacks, an alleged "military target" of the heroic Palestinian fighters was a cafe filled with mothers and their young children. Every state has an obligation under international law to prosecute and punish terrorists. This obligation derives in part from the vital expectation, "No crime without a punishment." It is codified directly in many basic sources, and is also deducible from the binding Nuremberg Principles (1950). According to Principle 1: "Any person who commits an act which constitutes a crime under international law is responsible therefore and liable to punishment." Terrorism is a serious crime under international law. The precise offenses that comprise this crime can be found, inter alia, at The European Convention on the Suppression of Terrorism. Notwithstanding Israeli government assurances to the contrary at the time, some of the Palestinian terrorists previously released in "good will gestures" were also guilty of related crimes of war and crimes against humanity. These are Nuremberg-category crimes so egregious that the perpetrators are known in law as Hostes humani generis, or "Common enemies of humankind." International law presumes solidarity between all states in the fight against crime, including the crime of terrorism. This presumption is mentioned as early as the seventeenth century in Hugo Grotius, The Law of War and Peace (1625). Although Israel has unequivocally clear jurisdiction to punish crimes committed on its own territory, it may sometimes also have the right to act under certain broader principles of "universal jurisdiction." Its particular case for such wider jurisdiction, which would derive from a reasonable expectation of interstate solidarity, is found at the four Geneva Conventions of August 12, 1949. These Conventions impose upon the High Contracting Parties the sober obligation to punish "Grave Breaches." No government has the legal right to free terrorists as a "goodwill gesture." Terrorism is a criminally sanctionable violation of international law, one that is not subject even to well-intentioned manipulations by individual countries. Moreover, in the United States, it is clear from the Constitution that the President's power to pardon does not encompass violations of international law. Rather, this power is always limited very narrowly to "Offenses against the United States." In its original capture and punishment of Arab terrorists, Israel had acted unambiguously on behalf of all states. Because some of these terrorists had also committed crimes against other states, Israel cannot now permissibly pardon these offenses against assorted other sovereigns. Although Prime Minister Netanyahu's anticipated terrorist release would not, strictly speaking, represent a "pardon," it would have exactly the same legal consequence. No state possesses any sort of authority to pardon violations of international law, especially the uniquely cruel violations generated by Palestinian terrorism. No matter what might be permissible under its own Basic Law, any political freeing of terrorists by Israel would always be impermissible. A fundamental principle is established in law that, by virtue of any such releases, the releasing state itself must assume responsibility for pertinent past criminal acts, and for future ones. Under international law, Prime Minister Netanyahu's intended release of Palestinian terrorists, effectively analogous to a mass pardoning of international criminals, would implicate the Jewish State for a "denial of justice." This implication could have profound practical consequences. Although it is arguable that punishment, which is always central to justice, does not always deter future crimes, any such Israeli freeing of terrorists would nonetheless undermine the Jewish State's legal obligation to incapacitate violent criminals. What sort of people and government would agree to free the murderers of its own women and children, and without any plausible expectations of a reciprocal peace or justice? Please, it should not be the people and government of Israel. Not again.